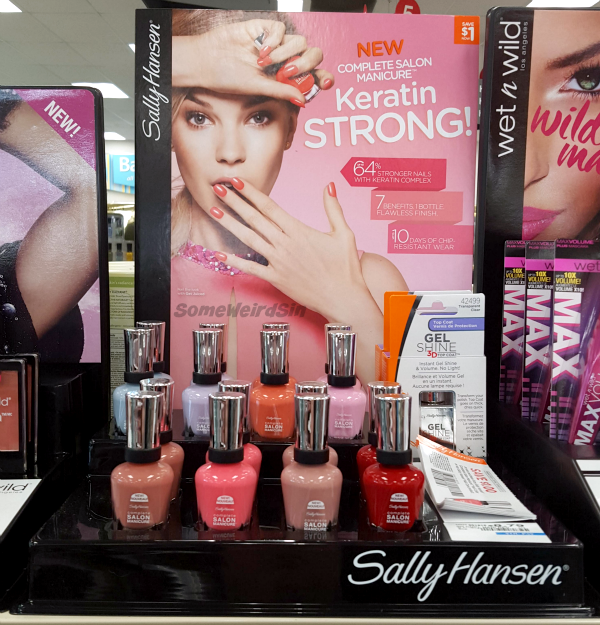 CVS - $5 ExtraBucks when you spend $15 on Sally Hansen nail, e.l.f., or Maybelline. $4 ExtraBucks when you spend $10 on Milani. 25% off Wet n Wild. Rite Aid - 40% off Wet n Wild mascara and nail. Walgreens - $1 off Wet n Wild priced $2.99 or more. 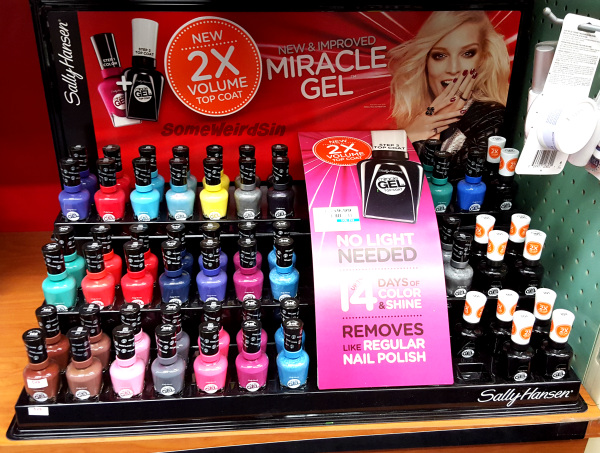 $2 off Sally Hansen Miracle Gel, plus get 1000 points when you buy 2. From 1/17 through 1/19, get 5000 points when you spend $30 or more. 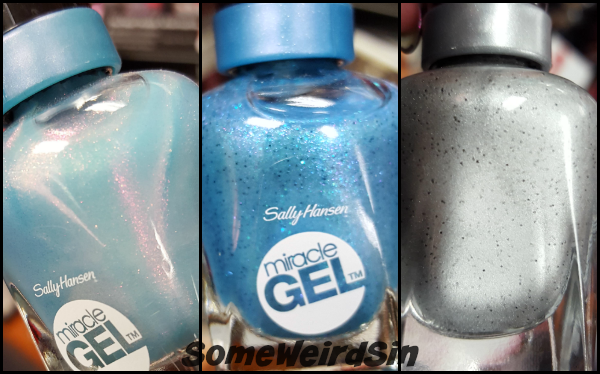 Despite it only being a couple of years old, Sally Hansen's reformulating Miracle Gel. The same weird label situation is going on with this line and Complete Salon Manicure. The old top labels have a shade number and name. New labels have either a shade number with a line between it and the name OR two numbers with dividing lines between the two of them and between them and the shade name. Weird, right? This is pure speculation, but I think the ones with only one number and a line are new and the ones with two numbers are reformulations of older shades. A little googling seems to support this idea. Flash-ionista might have been around for a while, but I don't pay a huge amount of attention to this line. The other two really do appear to be new. Let's Get Digital has a a Models Own Indian Ocean vibe to it, but with less oomph. I still bought it. Rock On looks a bit like a metallic Sinful Colors Stone Cold. Bought that one too. They'll get a post eventually. I'm still on a semi-hiatus. 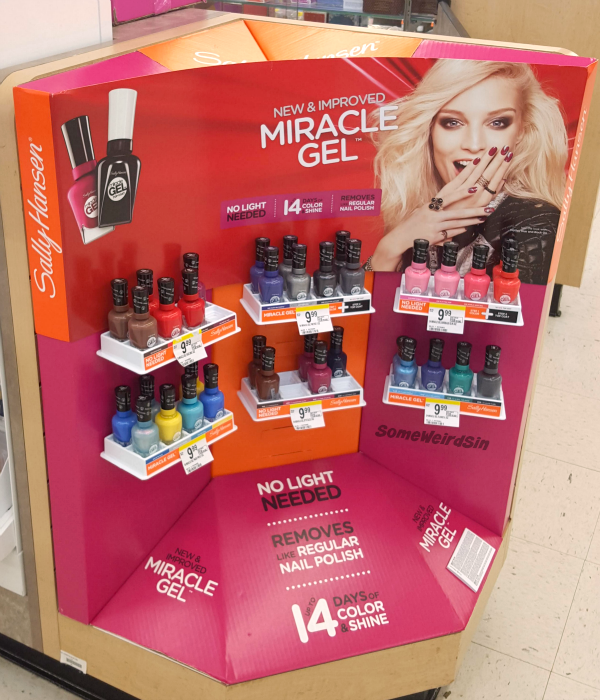 One of the Walgreens locations near me has this big corner display with most of the same shades as the shelf version. 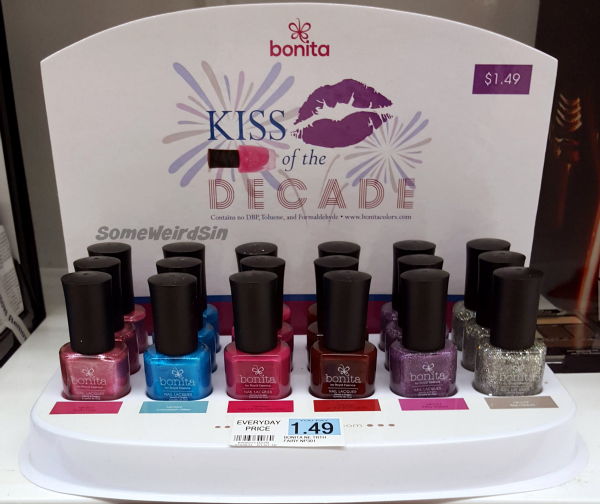 I still haven't tried Bonita, but this is another tempting display from them. Year Of Riches has a great shimmer to it. A bunch of the same stuff from the big Walgreens endcap showed up at the CVS near my house this week. More semi-new Bonitas. Flirty Shirley and Big Dipper have holo microglitter. More reformulated "Keratin Strong!" Complete Salon Manicure shades. All of these are core already, but the labeling's a little different. I wonder how this new formula compares to the previous ones. Anyone tried them yet? Oh wow! An actual display! 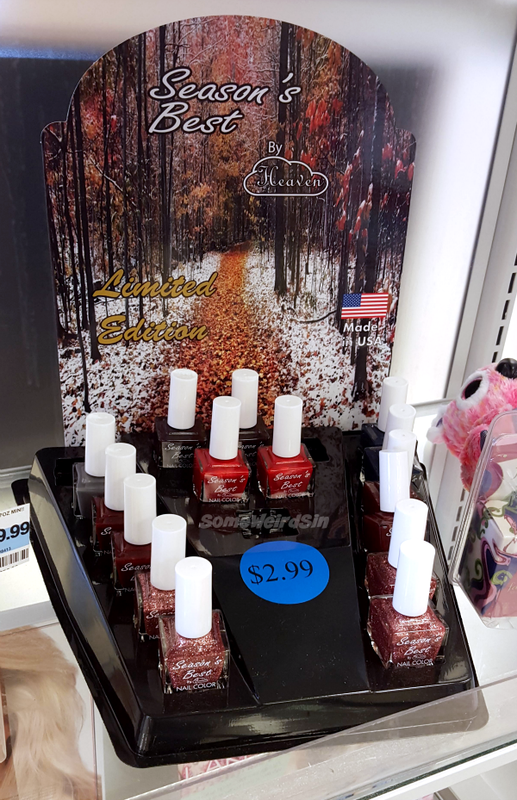 There's been a basket of Lit polish and gloss on the floor at this CVS for weeks. Some of the shades are tempting, but the $7.50 price tag? It'll take some serious coupons and/or a sale to get me on board. The caps on both products light up inside, which...yeah...weird. This is some kind of fall or winter thing. I have no idea. The same brand puts out the summer, Mardi Gras, etc. collections, right? 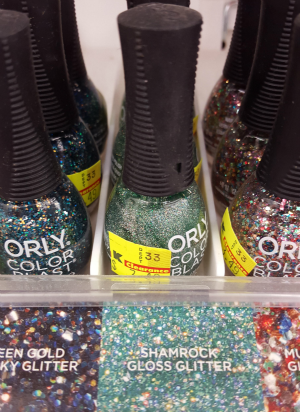 Ten-ish shades in Kmart's Orly Color Blast display are marked down to $3.49. Still more than I'd pay, but it's an improvement. Shamrock Gloss Glitter is Sparkling Garbage rebottled, and it's probably the Color Blast that the MUA Nail Board talks about most. Kmart can vary wildly with what's marked down, but this and the next one both have tags, so they're probably system-wide. I already have OPI Black Spotted, but I bought Get Spotted because...well...because. And $2! I did a test nail, and I think Get Spotted is actually easier to use than Black Spotted. 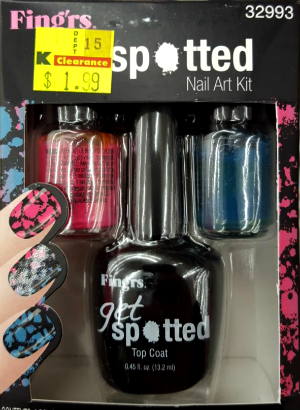 If you had any interest in spotted polish, you might want to try tracking this down. 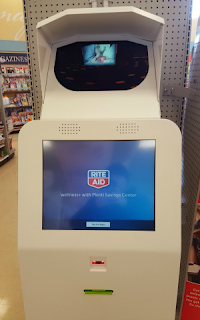 At first, I was hoping it was something like the coupon printer at CVS. I poked it a little, but I think it's just for signing up for Plenti. Meh. Also, is this the saddest attempt at looking modern or what? It's got some weird hologram thing at the top, which is totally unnecessary. It's also boxy and kinda reminds me of robots from tv and movies from 30+ years ago. I hinted at it above, but I'm extending my semi-hiatus. My fibroids definitely need to be removed. The doctor joked that I can join the circus and didn't completely contain how startled she was by them. I'm getting an ultrasound tomorrow and I'm meeting with the surgeon next week. Things are moving really quickly. I'm hoping that a lot of my discomfort, pain, fatigue, and other symptoms will be relieved by the surgery...but I know I might have to go on a full hiatus while I recover. My computer is still broken too. On top of all of that, I accidentally deleted the imgur folders that have my pre-edit swatch photos in them. They're backed up onto an external hard drive, but without a working computer... I can't even do Lost Swatches posts right now. Bleh. I'm far from done with blogging, life just isn't making it easy lately and I'm too tired to force it. I'm aiming for a swatch or NOTD post every week or two until things ease up, along with Sunday Shoppers whenever I have enough to write about or there's a good enough sale. tl;dr - I'll be around, just not much.